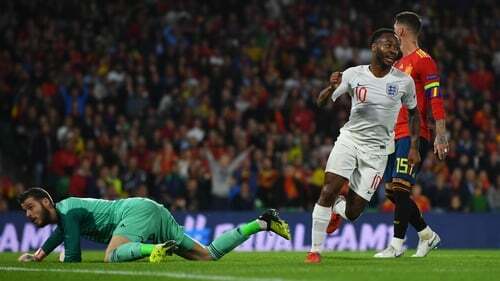 England ran riot with three first-half goals, including two from Raheem Sterling, to stun Spain and earn a 3-2 away win in the Nations League on Monday as they moved back into contention in League A Group 4 of UEFA's new competition. Sterling, who had not got an England goal for three years, struck again from another Kane assist to give Gareth Southgate's side a big halftime lead against Spain, who had scored 12 goals in their last three games and beat England 2-1 last month. Spain lead the group with six points after three games while England are second on four, leaving Croatia bottom with one point, although the World Cup runners-up have a game in hand.